Back To Boxing-Corner > The law of the long arm! The law of the long arm! Manny Pacquiao’s upcoming bout against Miguel Cotto has raised some questions, especially considering that Pacquiao will supposedly be at a disadvantage because he’s moving up in weight. Yes, attempts have been made to even matters out by reducing the contracted weight to a couple of pounds below the welterweight limit. 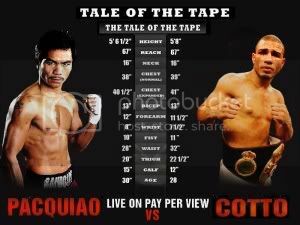 But today I saw a copy of the tale of the tape, and I notice that Pacquiao has exactly the same reach as Cotto – 67 inches. That’s very interesting. Suddenly, Cotto’s advantage shrinks. When the smaller, quicker guy can match the bigger, stronger guy for reach, then it’s a different ball game. I reckon reach is a far more telling statistic than even height! By the way, Floyd Mayweather has a reach of 72 inches – that would be a big advantage for Mayweather if he ever were to fight Pacquiao. Mayweather’s last victim, Juan Manuel Marquez, has a reach of 67 inches (the same as Pacquiao and Cotto).